How does a WBC ISP modify a customer's broadband package? Seems like a logical, albeit naive, suggestion, but if anyone has some insider knowledge as to how it happens then please inform. Let's say a customer upgrades to superfast fibre, how does the speed profile get changed by the ISP? Does the ISP have to go to BTw and get them to adjust the DLM profile speed band for that port or does anything else happen? I know VLAN bandwidth policing could be a possibility. Let's say a customer downgrades to ADSL2 -- does a technician have to come to the PCP cab again and disconnect? It makes sense that they'd free up a port for another user but if the cabinet is not near capacity it would seem like waste of resources to do so, until it was necessary and users could be disconnected in batch. I assume the ISP informs BTw of the change and they inform openreach that the port is no longer in use, they could remotely disable the port at the DSLAM for the CVLAN but how does the modem now sync with the MSAN in the exchange? The other option I thought of was to put the customer on an extra slow DLM speed band that resembles ADSL to save the complication of rewiring at the cabinet. Does anyone have anything to add on this procedure? Re: How does a WBC ISP modify a customer's broadband package? No idea of the ins and outs but the FTTC DSLAMs have nothing to do with BT Wholesale. They only do the backhaul from the exchange onwards and only if the ISP chooses to use them. For say a Talktalk FTTC customer it's entirely in the hands of BT OpenReach until it gets handed over to Talktalk at the exchange. With exchange based ADSL services it's BT Wholesale who control their own MSANs, and the LLU operators control their own MSANs. Nobody on these forums works specifically in this field so I suspect the vast majority of your questions above will either go unanswered or will lack some of the detail you seek. Let's say a customer downgrades to ADSL2 -- does a technician have to come to the PCP cab again and disconnect? If the customer cancels service completely they can be left jumpered to the FTTC cabinet if there is still spare capacity. This means it can be remotely reactivated. ISP places an order for FTTC. Openreach advises ISP of live date so the SP can lift any speed restrictions and set it to the relevant rate for the product they ordered. Openreach swaps over line to FTTC. Customer connects to FTTC. RAMBO detects sync now coming from an FTTC DSLAM's element manager as opposed to the MSAN in exchange. THE RAP part of RAMBO send notification via NCAS to the bRAS, which in turn can communicate with the DSLAM/MSAN to set DLM profile. RAP process sets IP profile. BTw's RAP process sends delta report to SP advising them of the IP profile. 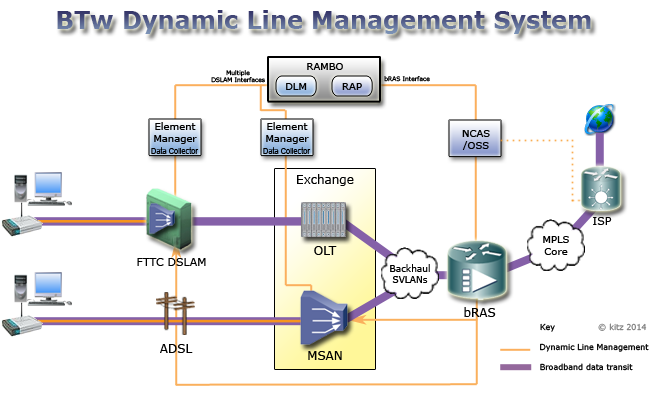 Note DLM system & RAP system is not the same, but both are functions performed by the RAMBO box which communicates directly with NCAS (Network Configuration & Assignment System). Sorry I've tried reading the first part of your query several times, but it's just making my head spin and I'm not quite sure what you are getting out. The ISP has nothing to do with the SVLANs. As far as FTTC goes, all the mapping is done by Openreach who have their own NCAS system. The ISP doesn't turn on the port that is also done by Openreach. The beauty of NCAS is that everything can be set up or configured remotely as far as mapping goes. Just needs an Openreach engineer to change things in the PCP to hook up the tie pair to connect to the FTTC DSLAM. Once that is done then the modem should sync to the FTTC DSLAM. The DSLAM is dumb in that it will let you sync, but until the NCAS system allocated a correct path allocated to your ISP you won't get Internet connectivity. I think Openreach has a specific name for their NCAS but can't recall it atm. BlackSheep may know. BT Wholesale don't use a pseudowire for each customer. They are delivered as PPP sessions over L2TP tunnels not native Ethernet. BRAS and LTS are present for aggregation. Migration to and from FTTC is a new provisioning of the respective service. FTTC and ADSL have completely different termination points at the customer end: one on an Openreach DSLAM, the other a BT Wholesale owned MSAN. The respective BT Wholesale SINs are available covering services. See earlier responses to another thread. @Weaver @Kitz @CarlT I've come back a few months later now I have more experience researching VPDNs and in this case VPLS and I realise I didn't know much at all back then but I'm going to outline what my best guess is now for WBMC/WBC customer ISP's and end users using FTTC. Note this is all complete speculation. The DSLAM is configured by openreach with an SVLAN and CVLAN per port when a port is ordered. I'm not sure if it's possible to add 2 VLANs on ingress to a switch port, typically the first switch would add the inner VLAN and the second the outer VLAN but this would mean that all ports on the DSLAM would be on the same SVLAN which cannot be the case as not all ISPs use WBC products and may go to openreach directly for a GEA cablelink and SVLAN and 2 CPs can definitely share a DSLAM. When a homeowner upgrades to fibre on a WBC/WBMC customer ISP, the ISP informs BTw of the customer and customer details; BTw informs openreach of customer and customer details and an openreach technician comes along, finds the E side pair with the customer land-line number (by connecting to the pair and calling a certain number and listening to the automated voice). The technican connects the customer D side to a DSLAM port and informs BTw which port they used. I'm guessing BTw has for each bRAS a CVLAN/SVLAN to DSLAM port mapping table of ports they've ordered from openreach and they report this back to the ISP which enables the ISP to insert a RADIUS entry on their LNS for the SVLAN + CVLAN combo (option 82) (but since the LNS could connect to multiple bRASes it might use extra info such as DSLAM port MAC addr inserted by relay agent). When BTw orders the GEA cablelink SVLAN and ports they'd have configure their bRAS in a certain way. My guess would be that they have a service instance + bridge domain + L2 VFI + pseudowire for each SVLAN on the bRAS which peers with the VSI on the LNS and sets up a MPLS LSP and pseudowire. VPLS doesn't maintain per-user sessions like with L2TP VPDNs which most likely check the source IP of packets to ensure they belong to a session and virtual access interface. Therefore, for VPLS, the source IP verification most likely lies in IP source guarding on the DSLAM ports. The only way to block traffic from a random statically set IP on the network is to disable DSLAM ports for non customers and IP source guarding ensures that only DHCP packets can pass unless they have the source IP sent in the offer after option 82 verification. >> The technican connects the customer D side to a DSLAM port and informs BTw which port they used. As above Openreach's NCAS system pre-allocates the dslam ports, the Openreach engineer (or contractor) wires up the tie cable in the PCP as per the job instruction given to them. They don't touch anything in the FTTC cab. >> all ports on the DSLAM would be on the same SVLAN which cannot be the case as not all ISPs use WBC products and may go to openreach directly for a GEA cablelink and SVLAN and 2 CPs can definitely share a DSLAM. I think you may be getting mixed up, the GEA handover port is not at the DSLAM... its a Layer 2 switch in the OLT located at the headend exchange. The OLT 'terminates' many DSLAMs eg all FTTC DSLAMs belonging to that exchange and also any FTTC DSLAMs from any child exchanges. Basically the OLT is the convergence point for all the Openreach FTTC DSLAMs in that area. The GEA cable-links attach to a port at the OLT (not the DSLAM). Think of the cable-links as being the tie between the Openreach L2 switch and the carrier's backhaul. The CVLAN identifies the EU traffic. The SVLAN identifies the grouped EU's coming off the same handover port. A dslam will be dealing with data for many different SVLANs. It doesn't care about SVLANs - it's dumb. It's possible that Cab A, Cab B & cab C etc can be carrying traffic for the same SVLAN. It's entirely possible that 2 people living next door to each other using the same ISP and going through the same DSLAM may be on different SVLANs, because the service provider may have more than one cable link port at the OLT. In it's simplest form, the CVLAN is the path to the EU's home between the OLT to house over Openreaches network, whilst the SVLAN is a wrapper around the CVLAN telling which handover port -> ISP backhaul to use. This is why I mentioned above the CVLAN is between the EU and the GEA handover port - not the dslam. I linked to an Openreach document which shows the CVLAN path. I've mentioned it several times in both this and previous threads. There is a section on the main website. ~ What is NCAS and OSS?. In fact that page supplies a lot of info about RAMBO and how it stores DLM and RAP profiles. There's even an image which shows how it all fits together. >> I'm not sure about atm is how BTw controls the broadband speed. DLM and RAP are the 2 main functions performed by RAMBo. It stores line profiles to give to the DSLAM. This information is updated via NCAS and the OSS. - Max Sync speed is controlled at the DSLAM, but RAMBo holds any DLM profiles to be applied to the line which affect the sync speed. >> More about PPPoE + L2TP sessions or in this case SVLANs and VPLS or these upgrade / downgrade scenarios. I'm getting the impression that you may be getting a bit hooked up on protocols without fully understanding the physical side of network and what hardware is used for what purpose first. I don't think there is too much that could be said about SVLANs. As far as most people are concerned they are just a pipe or path between A & B.